To continue beach science, let's take a look at some other common visitors to the seashore. Grab an identification guide and some binoculars, and a camera if you want, and let's investigate. 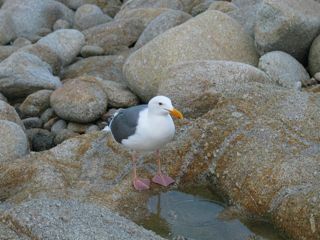 You may have seen sea gulls dozens of times, but have you really looked at one? Check out those pink webbed feet. Investigation 1. How do the beaks and feet of shore birds differ from those of the song birds in your community? How are they similar? Ever seen a pelican at the beach? Shore birds always seem busy. Investigation 2. 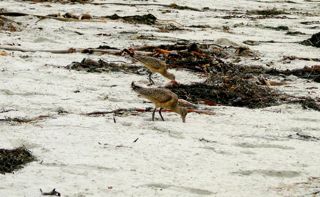 What do shore birds eat? Investigation 3. Do shore birds drink? Where do they get their water? 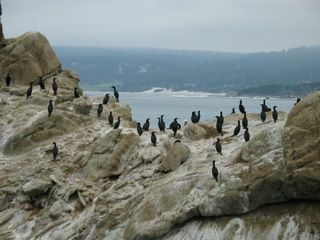 Shore birds are often in big groups, like these cormorants. Investigation 4. 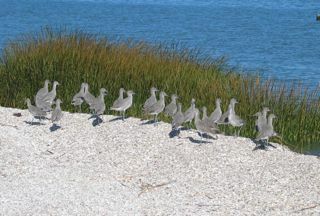 Why are shore birds often seen in flocks? Investigation 5. Where do different types of shore birds nest? (Hint for 4 and 5: think about bird movement or migration). Now lie down on the beach, close your eyes and listen. Investigation 6. What sounds do shore birds make? Hope you have fun discovering shore birds. Drop us a note in the comments and let us know what you find out. One of our favorite things to do is bird watch. These lively creatures are interesting because they are colorful, active and can be found almost anywhere. We can hear them sing and chirp. This time of year birds are migrating, building nests and raising babies. There is a lot of excitement in the bird world. You can simply look out the window and spot birds. Take a few minutes to see what kind it is and what it is doing. We learned our birds by figuring out a few at a time. We keep a notebook full of drawings and notes next to our favorite birding window. Each year we've had regulars who we recognize and also new birds. Last year we had house finch males with yellow on their heads instead of the more typical red or orange. This winter we had juncos for the first time. What can you do to encourage birds? Many people start by making simple bird feeders, such as the classic peanut butter on a pinecone rolled in birdseed. You can make another simple feeder by stringing fruit such as raisins, grapes, cherries or orange sections on a bit of twine or string and hanging it out. Just be careful because scattering food for birds can also attract unwanted guests, including bears in some areas! We have problems with roof rats so we only feed thistle seed. Niger thistle seed attracts colorful birds like finches and doves, but not pigeons or rats. Check with your local Audubon Society for recommendations. Making cards full of nesting materials can be a fun project that is easy to do with supplies from around the house. Gather index cards or three-inch by five-inch card stock, yarn, thread, hair, or anything else you think a bird might use in its nest. Brainstorm about what might be useful to a bird. Poke holes in the index cards (enough for all participants) with a hole punch or nail (with an adult’s help). Tie a 12-inch piece of string, yarn or ribbon through one hole to serve as a hanger. Loosely stuff the rest of the holes with a variety of nest making supplies, making sure the birds can pull it out fairly easily. When you are finished, go outside and hang the cards in bushes or trees where the birds will find the materials. Check over time to see which materials they chose first, second, etc. Refill the cards as needed. These supplies are actually useful to birds. We once had a bird fly away with the end of a kite string, spreading the string throughout the neighborhood as it unwound from the spool. If you get serious about birding, you might think about planting a bird garden. Find out abut which native plants in your area provide food or shelter for birds and add a few to your garden. Providing water through a birdbath or pond is also helpful as long as the water is kept clean and fresh. Check for more information in books, magazines and on the Internet.